Grace Dieu welcomes its new Director of Music! We are delighted to announce that Anna Hill will be Grace Dieu’s new Director of Music. Anna, who has been teaching singing at Grace Dieu for the last year and has championed many recent projects including taking part in Young Voices, joins the School full time as of September 2018 in the role of Director of Music. Anna studied Music at the University of Nottingham and has a Trinity College London CME qualification specialising in Primary School Music Education. 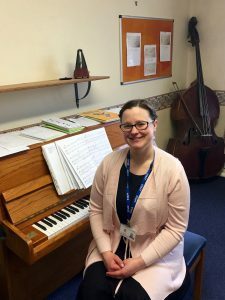 She has been teaching music in a variety of different guises – from individual lessons to running classes as part of the Derbyshire Music Partnership. She is a Kodály specialist – a child centered, all-inclusive musical education methodology which has a strong, and growing reputation in the UK. Whilst Singing is her main instrument, she holds five Grade 8s – in Singing and Saxophone at Distinction, along with Piano, Oboe and Recorder. She has a passion for Musical Theatre, as well as a keen interest in Opera.